Happy Thanksgiving! May God bless you and your family during this sacred season of gratitude. I wish you the joy of creating treasured memories with family and friends. On behalf of the Salpointe community, I thank you for doing your part -- as students, parents, past parents, alums and employees -- to make our school a welcoming, inclusive place where prayer, service and community are more than a list of values. On November 8 and 9, 1215 Lancers and 120 faculty/staff members touched Southern Arizona’s vulnerable populations by serving 100+ nonprofit organizations: we prayed with hospice patients; we fed the hungry at soup kitchens and stocked food banks; we listened to the stories of vets with PTSD; we read books with underserved children in failing schools; we worked at disaster relief agencies; we honored planet Earth by planting trees, prepping community gardens, pulling buffelgrass and clearing trails. The litany of service is heartwarming. 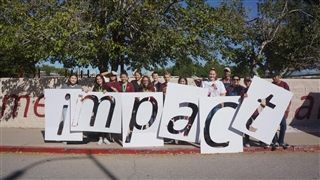 Click here to see photos of Salpointe students serving our community and living the Carmelite mission of our school. Special gratitude goes to the Salpointe Catholic Education Foundation for their long-term commitment to supporting excellence in education here at Salpointe. Thanks to the continuing generosity of the Foundation, Salpointe is able to retain its position as the premier secondary school in Southern Arizona. If you are not yet a member of the Foundation, please consider joining! As the New Year dawns, we will break ground on the “Aspire” project. With this $9M campaign, Salpointe will round out the student holistic experience by upgrading three key areas of the educational program: arts, academics and athletics. In the area of fine and performing arts, we will create a transformative, synergistic Salpointe Center for the Arts, with new or renovated learning spaces for Drama, Band, Choir, Dance, 2D and 3D Art as well as a theater lobby/art gallery. In the academic arena, we will renovate six classrooms and expand the STEM outdoor learning experience. In the area of athletics, we will expand the weight room, air condition the gym, and light the baseball, softball and track fields. Aspire with us! For more information, please contact me at 520-547-5878 or Jen Harris at 520-547-1952. Thank you for your confidence in Salpointe’s bright future. May God bless you and your family during this season of gratitude, hope and joy! 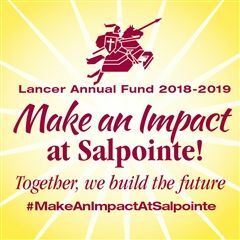 PS: Help a young Lancer who could not otherwise afford to attend Salpointe by designating your tax credit contribution to Salpointe through CTSO. Hurry, the deadline is December 31!